Two hundred years ago, English author Mary Shelley created a monster, and he’s still very much alive in the popular imagination today. 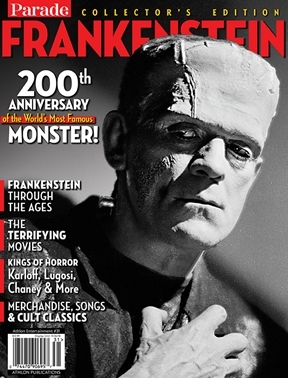 FRANKENSTEIN: 200th ANNIVERSARY SPECIAL, timed for Halloween of 2018, will trace the history of this legendary creature from his creation to its many iterations in literature and movies like the classic 1930’s Universal Studio’s Frankenstein series starring Boris Karloff, Mel Brook’s Young Frankenstein and The Rocky Horror Picture Show. Additionally, this collector’s edition will present a gallery of other great monsters Frankenstein has inspired, from classics like the Mummy and Dracula, to modern creations like Jason, Freddy Krueger and the IT clown.